I think you got the tour organisation just right. Also, I never felt that the pennies were being watched which is commendable and made for a relaxed atmosphere. I would happily recommend this tour, and the company as a whole, to anyone. We are planning to do another tour with you in two years. I cannot think of a single thing you could have done better. The overall experience was very good – I’d recommend Peak Tours very highly indeed for anyone thinking of doing a cycling tour. The logistics were very well organised – getting bikes to the start and then home again, brew stops, lunch stops, taking bags to rooms etc – all very well thought out and implemented. Clearly Peak Tours has a route that prioritises small country lanes, bike paths and the least congested routes possible. There were many days with lovely countryside and water views. The route up to Cairngorm was my personal favourite. The tour was very well organised throughout. Amazing variety of different accommodation places added to the interest. Most were very accommodating of cyclists needs. Congratulations! Great routes through places I was not expecting to be so nice. Excellent organisation, hard to find any room for improvement. I intend to book further tours with Peak Tours! I cannot think of anything that could make the tour better!! I don't know much about the route options.... but I felt the route was brilliantly conceived.... I don't know what % of the trip was done on 'busy' roads....but if felt like a very small %. The way you manage to circumnavigate Manchester without us realising it was phenomenal. Equally the route through the Cairngorns was challenging but we wouldn't have changed it. Other highlights were the early days with the ferry crossings and the lovely climb up the upper Lune valley. The route was as good as it could possibly have been. There is no way I could have found my way across the UK on my own. It was an incredible trip of a lifetime! I could not have done it on my own. And I wouldn’t have been able to do it for lesson money if I did it on my own. Peak Tours provide tremendous value for the experience. Loved the cycle path bits and countryside through the Lake District, Cairngorms & above. Good that busy roads were kept to a minimum. Excellent. Each day was better than the previous one. The numerous country lanes on the route made it a very special journey. The organisation, communication and most importantly the caring supportive nature of our guides Dave, Fiona and Joe was exceptional. Amazing route – cycling through very beautiful scenery most of the time. I have just completed LEJOG and have had one of the most enjoyable and satisfying holidays of my life. The Peak Tours package and support from booking, pre-tour and especially during the tour was 1st class. I am now home and thinking of a new cycling escapade for next year and it will be with Peak Tours. The tour was the BEST EVER – I have been extolling your virtues to all my cycling friends. Not really any suggestions for improvements, it was all brilliant. Just have to decide which one to tackle next year….. This was my first holiday on my own for over 45 years. I felt comfortable from the minute I arrived. Well done!! I was impressed with Peak Tours approach from the outset and have remained so since. The tour itself was great fun and much enjoyed. Guides and group made this an excellent experience and one that I will remember fondly! The whole tour was a pleasure, ran with military precision. Wouldn’t hesitate to recommend or book another tour. Route seemed good to me. I saw parts of the country I’d never experienced before and there was always something unique to see every day, so it wasn’t just a grind (as parts of a ride across USA would be). The food was a highlight for me. Just a fantastic experience. I hope to be able to join another Peak Tours adventure soon. The accommodation was really good. Some were outstanding – Moffatt was amazing. The route seemed perfect. The first couple of days got us used to short sharp hills. The climbing in Scotland was magnificent. I loved the Lecht. Great tour. I had a brilliant time and I feel I have really achieved something (with your help). Thank you. No suggestions on how the trip could be improved only sincere thanks to Dave, Simon & Matt who were exemplary. I’m already saving for next trip! I was really pleased with the tour overall. Loved the professionalism while being so friendly and relaxed – fantastic 2 weeks. Loved the route from beginning to end. I was a little worried before the start of LEJOG in case we’d be cycling on busy roads, but that really wasn’t the case. Lancashire to Cumbria was fabulous. Day 12 cycling up the Lecht was awesome!! Brew stops were always in the right place just at the right time with an excellent selection of food. The organised lunches were always very good overall. The tour organisation was faultless. We didn’t need to worry about anything, leaving us to just get on our bikes and cycle! Peak Tours provided a seamless LEJOG trip. The organisation was brilliant. John & I had a wonderful holiday – 2 weeks of endless eating and laughing! The route was beyond excellent – great scenery, quiet roads. Well worth paying for this insider knowledge rather than trying to organise myself. Would definitely book with you again. Excellent range of hostels and B&Bs! Love the way we get to meet the local community along the way! The route notes were fabulous! So detailed. We looked forward to reading notes the evening before the ride! Excellent tour organisation. You guys have thought about lots of things – thank you. My best ever 2 week holiday! I wish I could suggest something……but it was just so good that I can’t! Hope to join another tour sometime soon. Thank you again for the most fabulous cycle tour ever! Loved it! p/s I am much, much more confident of my ability now! The accommodation greatly exceeded my expectations. Almost without exception the hosts were welcoming, provided very clean facilities and an excellent breakfast!! The route was challenging but achievable. I liked the fact that we avoided the busy roads. The route notes were first class. They provided a welcome supplement to the Garmin and provided a little ‘light reading’ the night before. Profile gradients especially helpful. I couldn’t fault the tour organisation. In terms of the logistics required, shifting kit on a daily basis for 24 people, ensuring the right bag went in to the right room, I thought it was a great feat of project management by Tina and her team. Brilliant!! The tour far exceeded my expectations. Peak Tours are a superb company and I would thoroughly recommend them to friends and other cyclists. The tour overall was everything, and more, than I ever expected. I would definitely recommend this tour and your company. I am looking in to doing a future tour with Peak Tours. Peak Tours are certainly top of their game! Having just ridden Lands End to John O’Groats, everything was faultless, a great route, great accommodation, a great support team helping us all get through and making the whole journey a pleasure. They arranged great weather too! Special thanks for going the extra mile, as I have a problem with heights. Not an issue – they took me over the big bridges (Severn and Forth bridges) in the support van. They also accommodated my dietary needs as a diabetic and vegetarian. Having recovered from this ride I am already thinking about next years ride with Peak Tours. Excellent from start to finish. Stunning scenery, good roads, accurate GPX files and sensible routes round grotty bits and urban centres. I can’t praise the route makers enough. This made the trip extra special. With the food provided we wanted for nothing. A good mix of sweet and savoury and always in plentiful supply. The crew were great in getting in any requests and special treats. Everything on the tour ran smoothly and the crew took all the stresses of doing a 14 day tour from you. From booking to finishing everything was seamless. The route was spectacular, the crew supportive. I can’t rate Peak Tours highly enough. As well as raving about the whole event, I’ve mentioned so many times to friends how fantastic Peak Tours were; the Brew Van, the bags being delivered to the rooms; access to a day bag; Tina, Tori and Simon were great! Couldn’t fault the tour leader/backup; just part of the very well organised setup. The tour overall tbh was better than excellent! I’m already eyeing your France Coast to Med and looks like I have a few friends who may join me Summer 2020. There’s no point doing any of these events with any other company. 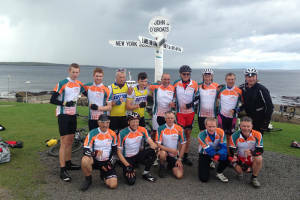 The Lands End to John O’Groats challenge or ‘LEJOG’ is our most iconic tour and we have been helping our cyclists complete this epic trip since 2010. In this time we have helped over a thousand riders to achieve their ambition of making it from one end of the UK to the other under their own steam. We cover the Land’s End to John O’Groats cycling holiday over 10 days and 14 days. The route is very much the same on both tours and we aim to keep away from main roads wherever possible, utilising the most scenic roads we can find. With an average of 70 miles per day, our 14 day LEJOG is a bit more relaxed than our 10 day LEJOG which averages at 96 miles a day. On all of our tours there is a mixture of abilities and you aren’t expected to cycle as one group, it is important to cycle at your own pace and you will naturally fall into smaller groups of similar ability. Usually the group on our 14 day Land’s End to John O’Groats tours will be made up of a mixture of keen cyclists and leisure cyclists wanting a challenge, whereas our 10 day tours will all be keen cyclists who are used to cycling regularly and will often be club cyclists. With this in mind you should consider carefully which tour is best for you, we will be more than happy to help you in making your decision.